When density and performance matter, Pivot3’s Modular FXB combines the storage efficiency of dynamic hyperconvergence with the physical density of Dell’s PowerEdge FX2. The platform consists of a high performance blade chassis with up to four servers in 2U running both the VMware vSphere Hypervisor and vSTAC OS. Pivot3 is uniquely suited to getting the most out of a modular server environment by combining the high IOPS performance of SSDs with maximum storage efficiency of vSTAC OS for a dense and powerful enterprise IT platform and a completely new approach to data center infrastructure. Pivot3 delivers hyperconverged infrastructure (HCI) solutions that maximize resource utilization, provide high availability that performs and offer flexible deployment options. Unlike conventional HCI solutions that strand critical resources on each node, Pivot3’s distributed scale-out architecture pools each HCI node’s compute and storage capacity for consumption by every VM and application. Pivot3’s patented Scalar Erasure Coding provides remarkably efficient high availability that maintains performance during degraded mode conditions. Start with what you need, and scale compute and storage to meet your specific application requirements. Pivot3’s distributed scale-out architecture aggregates all storage and compute resources into a common pool available to all virtual machines, which enables the platform to support four times the number of virtual machines as traditional infrastructures. Caching, bandwidth and IOPS, along with storage efficiency and capacity are scaled linearly simply by adding nodes to the cluster. vSTAC OS, Pivot3’s operating environment, consumes less than 10% overhead, leaving more system resources for VMs and applications. Pivot3's interoperability with existing storage and application servers allows businesses to leverage their HCI with existing IT investments. In addition to reducing datacenter footprint, Pivot3 delivers maximum capacity utilization and availability with half the nodes and at lower costs than replication-based systems. Most HCI solutions rely on replication for data protection, which sacrifices capacity for availability. Pivot3 provides the optimum combination of efficiency, protection, and performance that businesses need. Pivot3’s advanced fault tolerance maintains performance during degraded mode conditions, and sustains business operations after up to five drive failures, or if a node and drive fail concurrently. By converging compute, storage and VM management, Pivot3 automates systems management with capabilities including self-optimizing, self-healing, and self-monitoring. In addition to increasing end-user productivity, the Pivot3 vCenter plugin provides a single-pane-of-glass to simplify management of single and multi-site deployments. The platform is based on Pivot3’s HCI software and Dell’s PowerEdge enclosures and can be combined with Pivot3’s standard rack-mounted all-flash HCI nodes to achieve the optimal balance of performance, density and capacity to flexibly match the needs of any workload. Unified storage and compute in a HCI environment starts with only one box. Four PowerEdge enclosures with Pivot3 HCI software constitute a 4×4 erasure coding virtual Protection Group (vPG) that can be scaled-out linearly without limitations. VMware server, storage, and Pivot3 system certifications included, with optional vMotion, vSphere, VMware HA, and other VMware software sold separately through authorized reseller partners. With a low cost of entry compared with their integrated system counterparts and legacy infrastructure, the Modular FXB can be easily updated to allow rapid integration of new servers and modules as they become commercially available, so customers combine greatest performance possible with a solid technology foundation and roadmap for growth. The integrated architecture platform features density similar to that of the standard 16 blade chassis, but with the granularity of rack-mount servers so it is ideal for data consolidation. Six 9's (99.9999%) reliability protects up to three drive failures, or a full appliance and one additional drive failure for uninterrupted performance. The system offers an inexpensive way to maximize the amount of flash SSD storage and IOPS available for running workloads, preserving performance as you scale while using only 7% compute power. 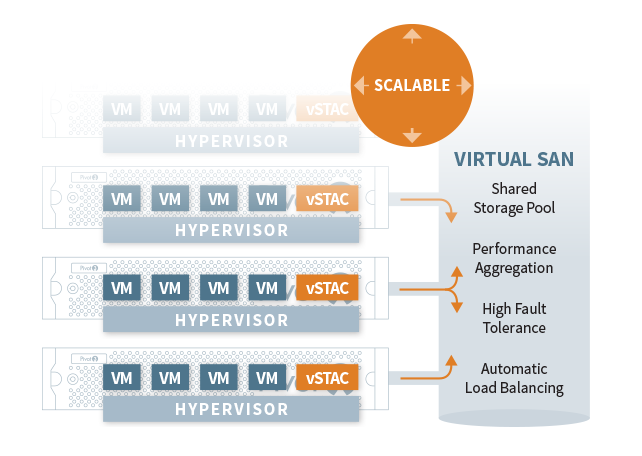 vSTAC OS forms a HyperSAN which achieves market-leading fault tolerance without resorting to data replication, resulting in extremely high storage efficiency of up to 94% available storage. Linear scalability aggregates bandwidth, IOPS and memory across nodes for dynamic expansion of both compute and capacity independently. Designed for ease of use with effortless management capabilities and self-healing simplicity, vSTAC Manager automatically configures nodes and runs on any PC, and Proactive Diagnostics keep storage infrastructure running smoothly and efficiently. vSTAC OS natively converges storage, compute and virtualization resources into a modular building block that can be rapidly deployed to run any enterprise application.